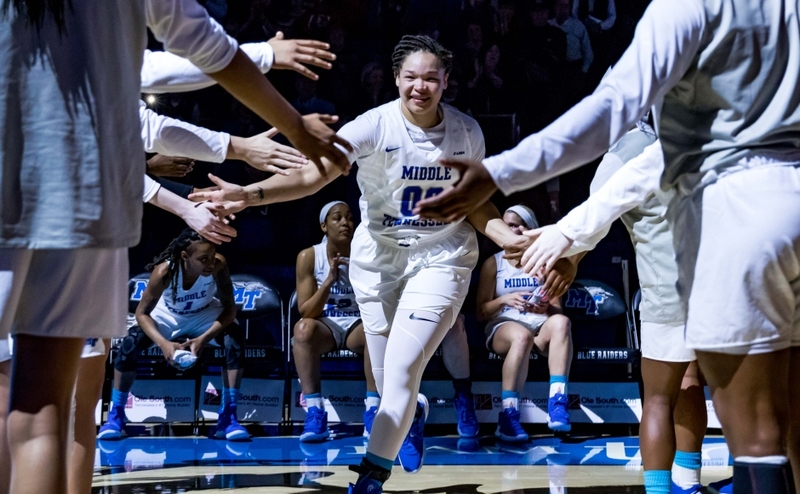 The Middle Tennessee State Lady Raiders Basketball team welcomed the University of Texas at San Antonio Roadrunners to the Murphy Center Thursday night. 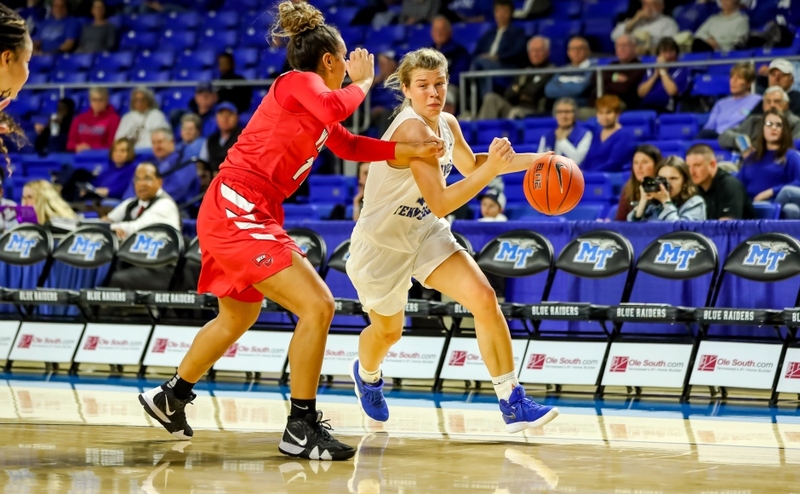 The Blue Raiders toppled the Roadrunners, 77-63, to remain in the top slot atop the Conference USA. Ty Petty got off to a hot start for MT and carried the team throughout the first quarter. She accounted for the Blue Raiders first 10 points of the game but the same couldn’t be said for the rest of her team. 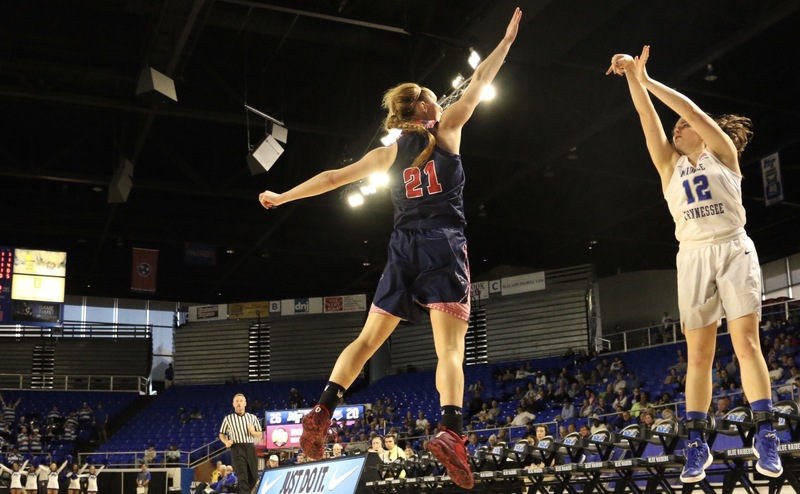 With a little over two minutes left in the first, Abbey Sissom was the first Blue Raider other than Petty to hit a shot. She nailed a bomb from the three point line to give MT the first lead of the game. The lead was short lived as the Roadrunners recaptured the lead with high quality shots. The Roadrunners shot over 50 percent in the first quarter and held a five point lead over the Blue Raiders. Coach Insell tightened up his Blue Raiders defense and moved the ball more fluidly in the second. MT contained the Roadrunners shooting to 25 percent and hustled for loose balls. Alex Johnson finally got going on offense as well racking up eight points for the quarter. The Blue Raiders found themselves back in control and was able to manage a slim lead going into halftime. The Blue Raiders kept the foot on the gas coming out of the half. The Blue Raiders fed Johnson in the paint and let her take charge of the offense. Petty, Sissom, and Jess Louro attacked from the outside nearly every opportunity they had. However, the Blue Raiders offense began to stall and began committing mental errors. The Roadrunners caught the break they needed and went on a 12-2 run to cut the deficit to one point to begin the fourth quarter. MT regained composure to begin the final quarter and their offense was revitalized. Ball movement and crisp passing propelled the Blue Raiders back to a comfortable lead. “That’s what got them back in the game, those three point shots, but there late we were able to move them out another step and get a hand up on the ball. They didn’t hit a couple of those and we got those rebounds. Those were big, crucial rebounds,” Insell said. 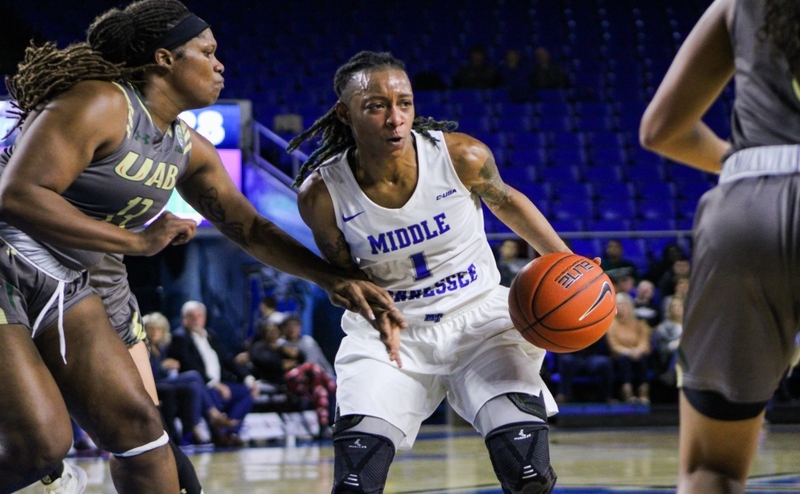 The Blue Raiders stifled the Roadrunners offense and held them to 25 percent shooting yet again for the quarter which allowed them to pull ahead by double digits. MT was rose to the occasion in the final quarter to win by double digits against UTSA, 77-63. Louro, Sissom, and Petty connected on 13 three-pointers combined with Louro and Sissom having five each. Johnson led the team yet again in points with 24. Louro also led the team in rebounds, 7, and Petty led in assists with 9. 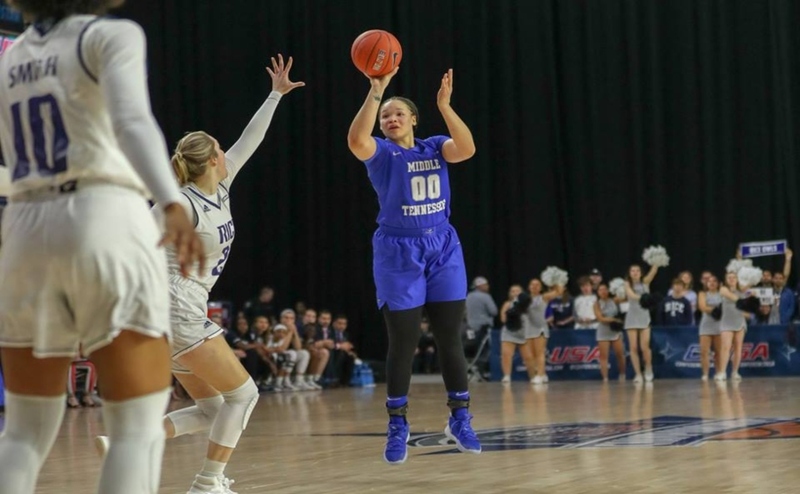 “Jess stepped into tonight, seized her opportunity, went to the boards hard, and knocked down a few threes,” Insell said. The Blue Raiders will look to sweep the weekend against the University of Texas at El Paso Lady Miners on Saturday. Tip-off is set for 7 p.m. at Murphy Center. Follow MTSU Lady Raider beat writers David Chamberlain (@D_Chamberlain_) and Keenan Taylor (@keenantaylor_) on Twitter for more coverage.